In this new story over at the Guardian that the Drudge Report linked to on Tuesday titled "Hell Freezes Over: How The Church Of Satan Got Cool", they immediately give partial credit for the 'rise of satanism in America' to Chelsea Clinton where in the subtitle they claim "Thanks to a canny social media presence – which has included messages to Chelsea Clinton – and progressive politics, satanism is an unlikely spiritual antidote to the Trump era". As Susan Duclos pointed out in this January 6th ANP story, Chelsea even took the time to reply to the church of satan, of which she has done several times, and as this Infowars story also pointed out, was joyous as she even took the time to wish them a happy new year for 2018. As the Infowars story points out, The Church of Satan was established in San Francisco, California, in 1966 by Anton Szandor LaVey. Also known as the Black Pope, LaVey reportedly engaged in cannibalism according to his authorized biography. And as we see within this ANP story as is specifically pointed out in the video published after the next section below featuring the head of the Russian Orthodox Church, Patriarch Kirill, the normalization of evil that we're now witnessing across America and throughout much of the entire planet could lead to the very downfall of humanity, the apocalypse and 'end times'. When we took the time to read the previously mentioned story over at the Guardian, we shouldn't have been the least bit surprised to learn that the piece was a PRO-satan story and an ANTI-Donald Trump story. With satanists lining up with Chelsea and Hillary as the 'spiritual antidote' to President Trump, what should that tell us about President Trump? 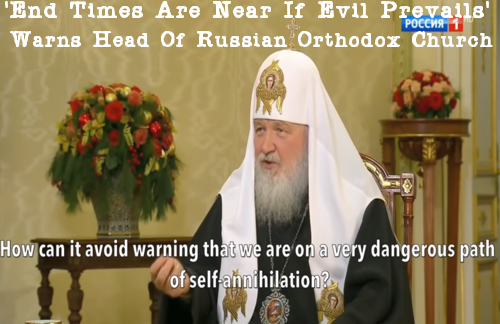 As Patriarch Kirill tells us in this translated video, never before have evil and righteousness been put upon the same level as we are witnessing now and the Patriarch issues this firm warning, "if evil prevails, the end times will be upon us." 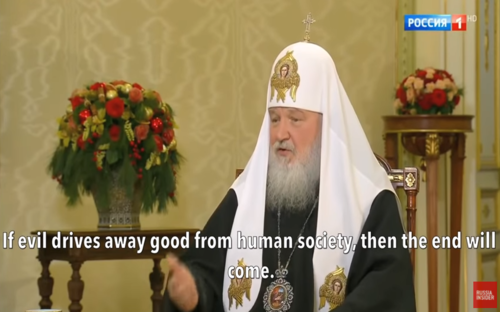 When asked about the apocalypse and if 'the end is near' and what would bring about such a scenario, Patriarch Kirill tells us "In the case when the human society stops to be viable, when the resources to exist will be exhausted which would happen in the case when we have absolute dominance of evil". Warning us that evil is not viable and in cases where systems are taken over by evil, those systems will fall, Kirill continues "If evil drives away good from human society, then the end will come". When asked by the interviewer "why do we have to talk about this today? ", Patriarch Kirill replies "Because we are now living through a special period in history. Never before did human society put good and evil on the same level. There were attempts to justify evil but never to say that good and evil are relative and not absolute truths. People's perception of good and evil was that they were absolute truth. But today they are relative. When can evil unrestrainedly grow in human society? EXACTLY when this point of view that good and evil are the same triumphs globally. And we are currently not at the beginning of this process but a certain amount of time has passed. History as we know it is exhausted, so how can the church keep silent? How can it avoid sending up an alarm? How can it avoid warning that we are on a very dangerous path of self-annihilation? If the church will not say this than who will?" As Susan Duclos pointed out in her January 6th story, the Chelsea Clinton - church of satan connection was just one of many going back many, many years tying together the Clinton family with satanic affiliations. And while Susan asked in her subtitle "Does anyone really want another Clinton in American politics? ", just imagine the permanent damage that could be done to America should somehow Hillary stage a comeback or a like-thinking Democrat/globalist propel themselves into the White House in 2020. While 2020 seems far away with President Trump in office, still at least 3 years on his plate, the thought of Hillary somehow escaping justice and figuring out a way to steal the 2020 election might be enough to pull one's hair out and while Hillary might be in an orange jumpsuit by then, the chance that another globalist will be selected by the Democratic party as their nominee is almost guaranteed. Yet if what we've really been witnessing over the past several decades has been a mission to transform America into a totalitarian nation, complete with the 'body count' that comes along with such government, should globalists get back into the White House in 2020 we might expect the full-scale persecution of Christians and anyone who is not one of them (an expansion of what we're seeing now with antifa and social justice warriors on campus and elsewhere), leading to outright civil war on US soil. How has our society allowed goodness and evil to be on the same level as Patriarch Kirill warns we're now witnessing? As he wisely mentions, this has been ongoing for quite some time now - we didn't just suddenly jump into the pot of boiling water we're now in. Evidenced by the tweets put out by the daughter of a former US president and numerous other stories across the country, we've allowed evil to not just slip in but grab hold of our government and institutions. 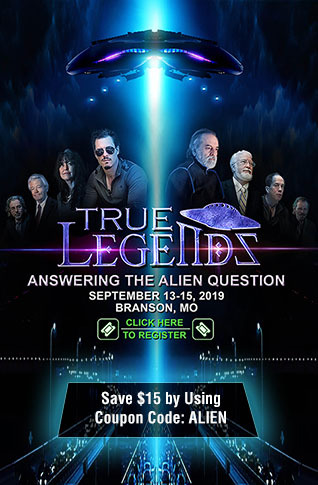 As Steve Quayle reminds us, one of the 'signatures' of the globalists is a demonic hatred of Jesus. With nearly 50% of the country voting for Hillary in 2016 showing us just how many people have blindly accepted the hatred, treason, corruption and outright depravity that come to us from the globalists, we see just how far down the path we have already traveled that Patriarch Kirill warns us of. As this story over at Through The Looking Glass titled "Q Anon: Learn To Read The Map" proves to us, not only does this sickening corruption run deep, it's been pervasive throughout 'elite' society for more than 100 years, helping to show just what President Trump and Christians are up against as the clock ticks ever onwards towards 2020. In the next video below, Judge Jeanine shares with us some news that we could all look forward to coming true - Hillary Clinton may soon have to face a REAL investigation into her endless crimes. In the 2nd video, Milo tells us why he is sick of the 'religion of Oprah' (the obvious globalist choice for 2020) while the final video below shares with us more recent 'end times signs'.